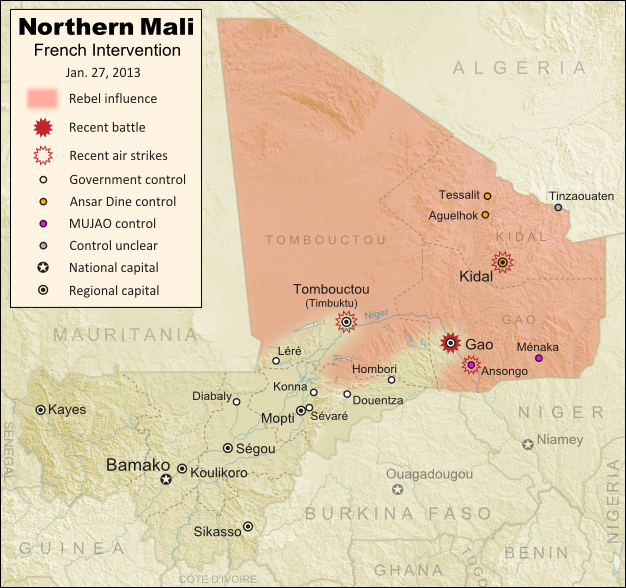 Updated map of territorial control and fighting in Mali, as of Jan. 27, 2013. Map by Evan Centanni, modified from Wikimedia map by Orionist, using images by Carport and NordNordWest (source). License: CC BY-SA. Events have proceeded quickly in Mali's ongoing war since the France's military intervention against radical Islamist rebels began just over two weeks ago. This weekend, French and Malian troops recaptured Gao and Timbuktu, two of the three major towns seized by separatist rebels last spring and taken over by radical right-wing militias a few months later. After taking back most of the country's central region earlier this week (See: Mali Map Update 2: Douentza Secured by Government), the allied French-Malian forces proceeded northeast from Diabaly and Douentza. On Friday, they took the town of Hombori on the road to Gao, even as Al Qaeda linked MUJAO rebels destroyed a bridge near the border with Niger in order to obstruct a looming invasion by Nigerien and Chadian troops. On Saturday, the French and Malian armies seized Gao itself, where they seem to have encountered a limited amount of resistance from the rebels of MUJAO. Many of the militants had already fled the major cities after weeks of French airstrikes against their positions, and on Sunday the allied troops swept quickly through Léré and all the way to Timbuktu, where they are reportedly now establishing control. Also in the past week, a major faction of the rebel group Ansar Dine defected, forming a new organization called the Islamic Movement for the Azawad. The new faction, dominated by Malian Tuareg people, claims to renounce Islamic extremism, instead saying they want to negotiate peacefully for increased autonomy in the country's north. Meanwhile, the French and Malian armies are receiving increasing support from other countries. The U.S., though not directly involved in the conflict, has been providing logistical support to the French military. And several days ago, troops from the neighboring country of Burkina Faso became the first foreign African forces to be deployed alongside the Malian and French contingents (though they still aren't on the front lines). On a darker note, accusations have spread of ethnically-motivated murders of Tuareg and Arab civilians by the Malian military (the northern rebels are mostly Tuareg and Arab people). This comes amid the mysterious barring of foreign journalists from towns occupied by the Malian and French forces. Officials have denied any knowledge of such killings, but human rights organizations have been increasingly raising alarms over the alleged abuse.